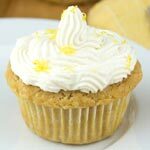 Celebrate spring or Easter with these low sugar lemon buttermilk cupcakes. Super moist, lemony cakes are topped with fluffy vanilla whipped cream and lemon zest. Use a tablespoon to drop a dollop of whipped cream onto each cupcake, or use a piping bag and decorative tip to create a more formal look. If you don't have a piping bag, you can use a medium sized freezer bag. Fill the freezer bag with the whipped cream, cut a hole in the bottom corner of the bag, and pipe the cream through the opening. Preheat the oven to 350 F. Line 12 muffin cups with paper liners, or grease muffin pan. In a medium bowl, whisk together the flour, baking powder, baking soda and salt. In a large bowl using an electric mixer, beat the butter until fluffy. Beat in the applesauce, eggs, lemon rind, vanilla and lemon juice. Stir the flour mixture into the butter mixture alternately with the buttermilk, making 3 additions of dry ingredients and 2 of the buttermilk. Spoon the batter into the muffin cups, filling about 2/3 full. Bake the cupcakes until golden and a toothpick inserted into the centre of a cupcake comes out clean, about 18 minutes. Let cool completely on wire rack. Frost cupcakes with Low Sugar vanilla whipped cream frosting. Pour the cream and vanilla into a medium bowl. Using an electric mixer, beat on low until soft peaks form. Spread onto cupcakes with a palette knife or using a tablespoon, drop a dollop of whipped cream onto the top of each cupcake. Adapted from: Lemon Buttermilk Cupcakes from www.canadianliving.com.